Discussion in 'Political Opinions & Beliefs' started by Mineva, Dec 20, 2015. Osmanli aka Ottoman State is back. After the collapse of established evil scheme following the World Wars, today Osmanli is back under the menagement of AKP government only in 12 years. Here you will find some small details and news about Osmanli State. * Osmanli has established a military base in Bashiqa region of Mosul/Iraq to control energy transition points. The pipeline between Qatar-Osmanli-Europe is going to pass from Bashika region. Osmanli also prevents Russia, Iran and Germany to have a pipeline which also was planning to pass from this region. * Osmanli camping in Bashiqa/Mosul been attacked by a large group of ISIS terrorists using Russian made Katyusha missiles. About 250 ISIS terrorist are neutralized. You want the Ottoman Empire back? Is this true for most Turks? This thread is weird and seems to be trying to begin some strange new conspiracy theory or possible trying to forward strange Russian propaganda that does not make sense. It's akin to claiming The Huns are taking China back because some guy in Beijing is wearing Yak fur clothes. Oh good.. You scared me for a minute. This is awesome though ! I think its more of a posibility for a new Yugoslavia than a new Ottoman Empire. Turkey will definetley have more interests in for example Balkan region, but Its har to think that they will try to conquer it. Maybe if the "(*)(*)(*)(*) hits the fan" and they might try but otherwise. Muslims pervade pretty much that entire area already. 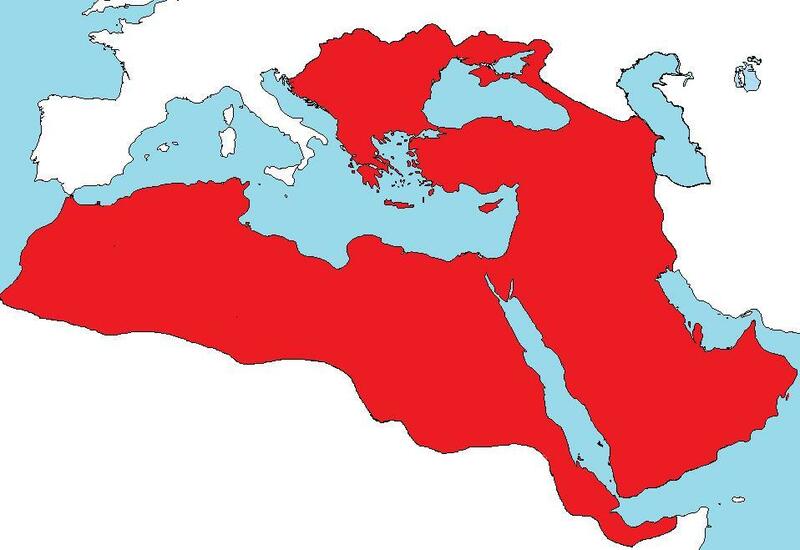 A large part of the 'area in red' was originally part of the Roman and Greek empires before it became part of the Ottoman Empire. Maybe it is time for Europeans to take back what was theirs before it was yours. If it weren't for the schism between the Greek Orthodox and Roman Catholic churches, most of that area would still be European and Christian. So Turkey has invaded Iraq and now claims it is part of Erdogan's new Ottoman Empire. Interesting! I guess what Erdogan says and what Erdogan does supersedes all international law. Out of curiosity, does the UN know about that? As for ISIS attacking the camp, are you sure it wasn't Hezbollah? If I recall didn't they say they would attack if the Turkish troops didn't leave Iraq? I mean why would a group that Turkey supports like ISIS, attack the very nation that supports it? Anyway it's nice to know that Erdogan's future aspirations towards becoming a 'sultan' is appreciated by so many of his followers. Erdogan has been trying to reclaim the Balkans through conspiracies and intrigues...and with Washington's help of course. Albanian is now claiming that every land Albanians live in should be part of greater Albania. This includes part of Greece, part of Macedonia, part of Serbia and I believe part of Montenegro. Don't believe for one moment that Turkey was not behind the illegal war against Serbia, nor the war in Bosnia. So as a Russian you are claiming the Turks want a new Ottoman Empire.. yet the Ottoman Empire has been non existent since 1916.. When did the Soviet Union collapse? Wasn't it in 1989? * Osmanli State is going to create another military base in Jarabulus/Syria, which is another important point of energy transit lines. Margot it's what Erdogan's followers want. ..and this is why they voted for him. They are his power base, and if he doesn't give them what they want he will lose them...as well as the sultan's throne he craves. Erdogan has built himself the biggest palace in Europe, and the war with the Kurds was started so he could gain the seats he needed to change the constitution. This is why he is considered a loose cannon and dangerous. Devotoglu wrote a book about their aspirations, it's called 'Strategic Depth'. This is why they are known as the new Ottomans. If you followed Erdogan's actions and his illegal claims in the Aegean and Eastern Mediterranean, as well as his trouble making in lands as far away as China, you would realize it. He has troops now in Qatar, which doesn't bode well for them. Erdogan has no loyalty. * Priority areas which are going to be ruled under Osmanli State. You are projecting you know? It's a common practice to deflect from oneself by accusing others. Davuto&#287;lu has called for Turkey to become more than just a regional power within Europe and the Middle East and expressed a desire for Ankara to have a far more influential role in world politics. Davuto&#287;lu is generally linked to the notion of Turkish neo-Ottomanism, which favours a commonwealth with its neighbours and old Ottoman connections. Although his foreign policies have been regarded as neo-Ottomanist by Western and especially U.S. media, Davuto&#287;lu does not accept such a characterization. He stated in an interview with Turkish daily Sabah that "as much as we don't use this conceptualization, the fact that it is being used against us is either because of misunderstanding or lack of goodwill." He argued against the idea that Turkey is trying to establish a neo-Ottoman imperial order: "I have said that Turkey as a nation-state is equal with any other nation-state of our region whether it is small in population or area. We don't have any hegemony on anyone. Rather what we are trying to do is to contribute to the establishment of a permanent peace in our region. If by order they mean is Pax Ottomana, Pax in the meaning of order, we are trying to establish a order, it is not wrong to say such thing." In 2013, Davuto&#287;lu spoke of developing a closer union between former Ottoman lands, though stated that territorial claims would never rest on historical borders. I guess Greece isn't a priority, except for the Aegean and Crete. So tell me, what does Russia say about all this? * Turkey is going to pay compensation to Russia in Jenuary, for Russian pilots. In other words he wants peace by putting all the nations under Ankara's control. Uhhh, out of curiousity, how many reporters are now in jail in Turkey? It was a hundred before, but now I read they arrested forty more. Does this include the former owner and editor of Zaman? What about Hurriyet? I read Erdogan's followers destroyed the offices in Ankara for a third time. I am not a Russian. I am closely related to Greece, so I have a good knowledge of the Turkish illegal and criminal actions which have been conveniently covered up for political expediency. I have another question. What about the majority of the people living in those lands? Do they want Turkey's governance, or doesn't it matter?